Sara Takanashi greets fans at a ski jumping World Cup event in Hinzenbach, Austria, on Sunday. Takanashi finished second in the women's normal hill individual competition, reaching the podium for the sixth time this season. 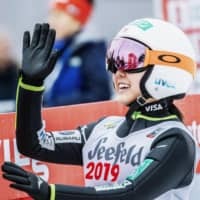 HINZENBACH, AUSTRIA - Sara Takanashi finished second in the women’s normal hill individual competition on Sunday as Norway’s Maren Lundby claimed her fifth straight World Cup victory. 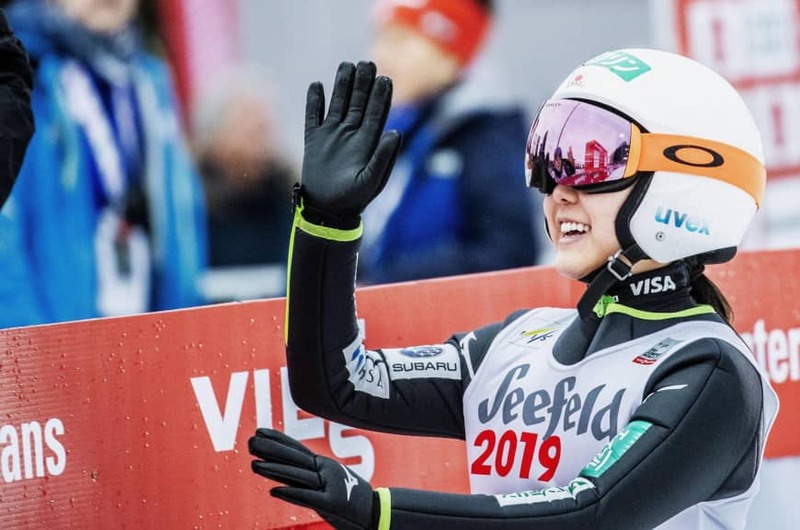 Takanashi landed on the podium for the sixth time this season after posting jumps of 88.0 and 89.0 meters to net 241.2 points in Hinzenbach, Austria. The 22-year-old said she owed the distance to smooth takeoffs and looked elated to be holding a trophy again. Lundby, this season’s overall leader, extended her win streak with jumps of 90.0 and 88.5 to finish with 250.8 points. Germany’s Katharina Althaus, who trails Lundby in the standings by 121 points, took third. Among other Japanese jumpers, Yuki Ito finished eighth, while Nozomi Maruyama and Yuka Seto placed 22nd and 26th, respectively. Kaori Iwabuchi did not advance to the final round. Takanashi, who holds the record for most individual World Cup victories, is winless on the circuit this season but extended her women’s World Cup podium record to 93. She is second to only retired Finnish ski jumper Janne Ahonen, who had 108 podium finishes in his career. “There’s a (competitive) difference between men and women but the record still stands, and that becomes motivation for training,” Takanashi said. Takanashi is fourth in the World Cup standings this season, 15 points behind Germany’s Juliane Seyfarth, who finished fourth on Sunday. The circuit’s next stop is Ljubno, Slovenia, where jumpers will contest two individual and one team competition between Friday and Sunday. Japan’s men’s ski jumping World Cup points leader Ryoyu Kobayashi failed to convert a first-jump lead into a second straight win, dropping to ninth overall in the flying hill event in Obertsdorf, Germany. The 22-year-old flew 220.5 meters on his first attempt but could only back it up with a 206.0 second, allowing his rival in the overall points race, Germany’s Kamil Stoch, to record his first win of the season. “It was difficult because the wind was a little strange. I got too much wind on my upper body and wasn’t able to extend my lower half,” said Kobayashi, whose points lead was cut to 451 with nine events remaining. “It was the same kind of challenge I had on the first day (when he finished 14th). The wind was difficult that day as well…Since there was a ton of snow, I think it was also hard to (build speed),” he said.